For the past few summers White Admiral butterflies have visited our garden, and each year, due to my lack of success in photographing one, I have fondly referred to them as my nemesis. 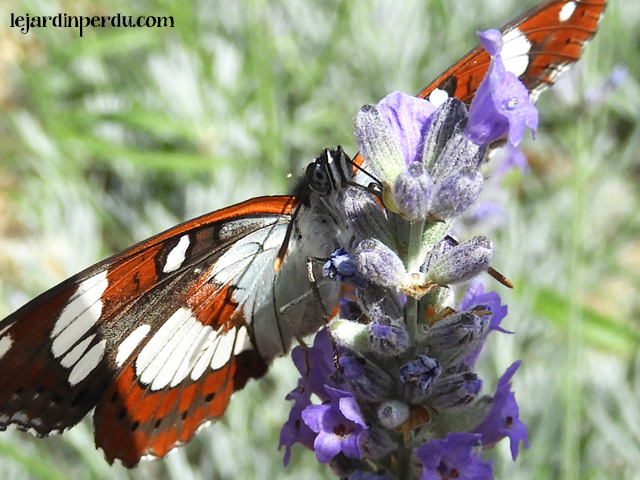 That is until this summer, when this White Admiral succumbed to the charms of our lavender. 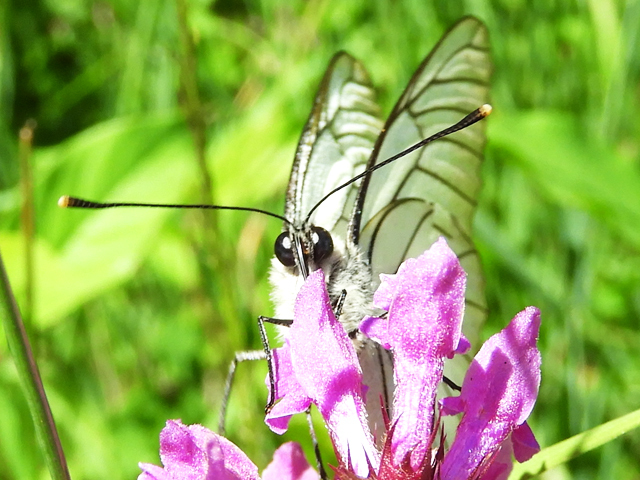 This butterfly is in fact a Southern White Admiral. 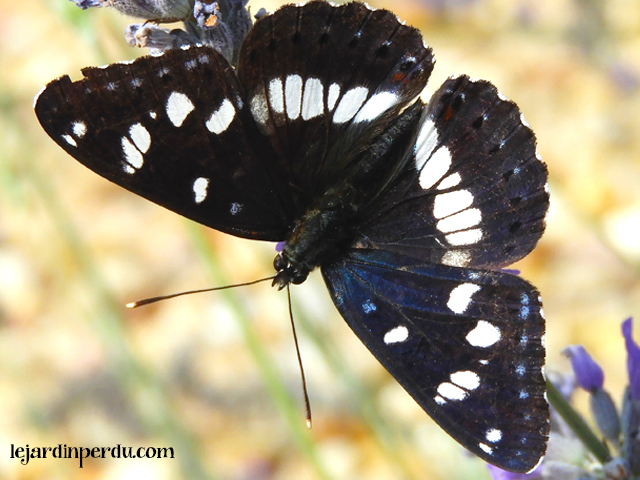 It is very similar in upper appearance to the White Admiral (Limenitis camilla) found in the UK and across most of France, but can be distinguished by slightly different markings on its underwing. It’s French name is Le Sylvain Azuré. The Southern White Admiral has a large silvery-white area close to its body and a single row of black spots towards the outer edge of the back wing. The “normal” White Admiral has two rows of spots in this area. You can clearly see this single row of spots in the above photograph. 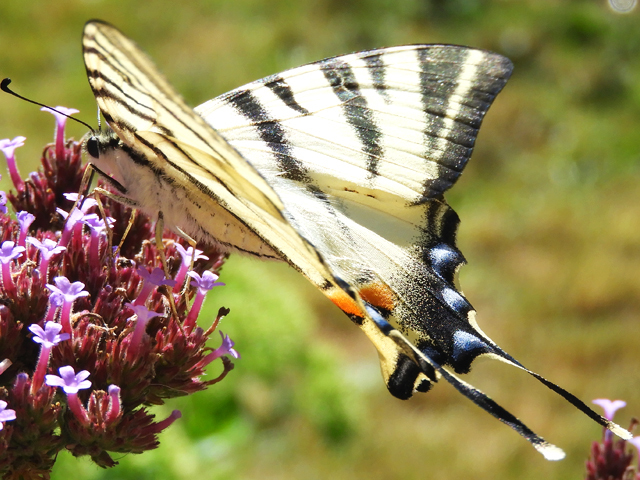 The upper wings of the butterfly appear dark brown/black in colour but when the light catches them they have a beautiful blue sheen to them. 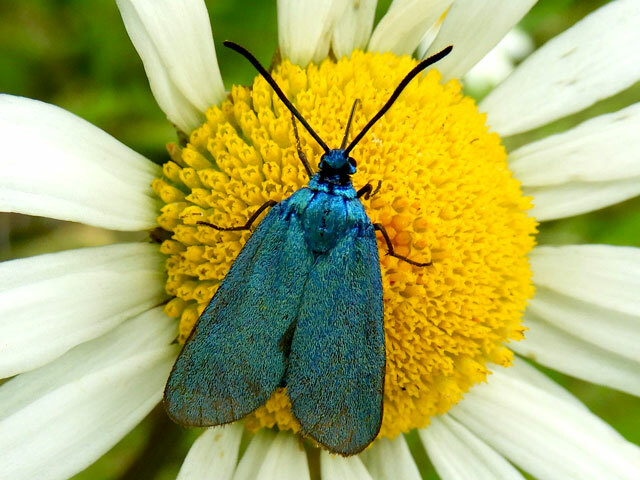 The butterfly prefers open woodland and forest edges up to heights of about 1500m. Sightings occurring more frequently when there is also a nearby stream or damp area. It is normally found towards the South of France though sightings have been reported in North West France. During hot summers Southern White Admirals can be seen in flight from June to September. They’re certainly still in our garden at the moment and I’m hoping to take more photographs of them before they disappear for another year!